The Santuario de Guadalupe in Santa Fe, New Mexico, built shortly after 1776, is the oldest, still-standing shrine built in honor of Our Lady in the United States. The Santuario de Guadalupe was constructed adjacent to the Santa Fe River and near the end of El Camino Real (Royal Highway), a colonial trade route from Mexico City through Chihuahua to Santa Fe. CoIonists from Mexico in the 17th and 18th centuries brought devotion to Our Lady of Guadalupe with them to what is today the state of New Mexico in the United States. The first church of Our Lady of Guadalupe was a tiny adobe structure built as a shrine to Our Lady of the New World. The Santuario not only served the faithful from the City of Santa Fe, but welcomed travelers who ventured into the city. The church is also home to the largest oil-on canvas Spanish baroque reredos (altar screen) painted by by Jose de Alzibar 1783 anda statue of Saint Juan Diego by renowned artist Gogy Farias from Mexico City. 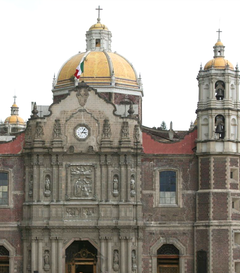 This Roman Catholic Shrine was built in Mexico City near the hill of Tepeyac where Our Lady of Guadalupe is believed to have appeared in 1531 to Juan Diego. His original tilma, or cloak, which holds the image of Our Lady of Guadalupe is on display here. Due to sinking foundations, a New Basilica was constructed on the site of the Old Basilica between 1974 and 1976. The new Basilica has a circular floorplan so that the image of the Virgin can be seen from any point within the building and can accommodate up to 50,000 people. On the Sanctuary grounds, there are many other buildings including the original chapel on the exact site of the apparitions to Juan Diego called the Capilla del Cerrito and the Old Basilica consecrated in 1709, as well as other chapels where Masses and other sacraments of the Church are celebrated daily. 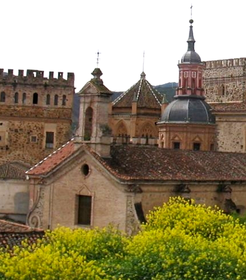 This Roman Catholic monastery is located in Guadalupe, Cáceres, a province of the Extremadura autonomous community of Spain. At the feet of the eastern side of the Sierra de las Villuercas mountains, it was one of the most important monasteries in Spain for more than four centuries and was declared a UNESCO World Heritage Site in 1993. It was established in the 13th century, when a shepherd named Gil Cordero discovered a statue of the Blessed Virgin Mary on the bank of the Guadalupe River. The statue may have been hidden there by locals when the Moors invaded in 714. A chapel was later built on the site of his find and dedicated under the title of Our Lady of Guadalupe. P.S. - Where else in the world do you find Our Lady of Guadalupe? 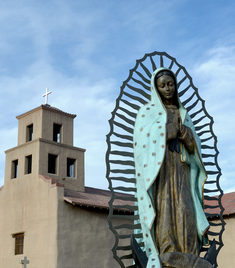 If there is a place that you know of where Our Lady of Guadalupe is held sacred, please share it with us and send in the name, location, details, and even a link if you have one. We may add it to the list here and will keep you posted. Thanks!